Good morning, darling Housewives! Now that our refrigerators are sparkling and pretty inside, it's time to move on to our next task. We are going to tackle the pantry now. And in case you were wondering why in the world I could admonish everyone by saying the pantry is NOT a mushroom, it is because most people treat the pantry that way. They keep it in the dark and it's covered in dirt! I know that us Housewives don't do that, but you would be surprised to peek into the pantries of those who are homekeeping-phobic or those who would love to be an efficient homemaker but have no idea where to start or what to do. Pantries tend to be neglected more than any other area of the home with exception of the utility closet, but most use their pantries as a utility closet as well. I'm going to tackle this as if your pantry is a multi-purpose area. If you are fortunate enough to have separate closets for brooms and paper/cleaning goods, and the like, then only take out the points that would pertain to you. Let's get started! Remove everything from the pantry. Every can, box, bag, crumb of food. Remove all cleaning supplies or paper products that you may have stored there. The pantry should be completely empty. Sort through the items you pulled off the shelves/hooks and discard anything that's past it's prime. If you have items that are still good and you don't plan to use them, DON'T TOSS THEM OUT! Set aside a box of these items to deliver to your local food pantry, shelter, or church for those less fortunate. These places are always in need of donations and every little bit helps. Any cleaning product that you are going to get rid of need to be properly taken care of. Be sure to read labels for disposal guidelines. Most can be flushed down the drain with lots of water and the container recycled. If you have some things that are a little stronger and require different disposal techniques, be sure to do so appropriately. Contact your local waste management company for advice or instructions on where to take these things. Now that you have room to work, it's time to clean. First, dry dust the shelves and walls to remove any dust and crumbs. Sweep the floor to prevent any dirt/dust from becoming wet and hard to clean up. This way any drips from the cleaning will not create a bigger mess. FIll a bucket with warm water and a drop of two of a gentle dishsoap or an all-natural cleanser. (I really like Dr. Bronner's liquid soaps for this type of job. The peppermint or eucalyptus scents work especially well, although any of them are perfect for this project.) Grab about 6 cleaning cloths from your rag bin stash and lets get to work. Wash down each shelf. As your cloth gets too dirty to continue, toss it in your washing machine and grab a clean one. Keep going until all shelves have been cleaned. Next, wipe down the walls. Start at the top and work your way down. If any drips get on your clean shelves, simply wipe them away. Using a spray bottle, lightly mist your shelves with a very weak vinegar and water solution. This will help to ensure a thorough rinsing of any residue, and will also act as an antiseptic for anything that may have been setting up home in your pantry. All that is left to scrub is the floor. This is one of the times that I encourage a little bleach in your water. This will ensure that no pests decide to meander on in and make themselves comfortable. Give the floor a good scrub with a natural bristle brush and rinse thoroughly. Leave the door open to air and dry the pantry while you go on to the next step. Now I want you to wipe down any jars or cans that will go into your pantry. Dust off any boxes that will be returned to the shelves or, ideally, empty the contents of the boxes into airtight glass or plastic containers. 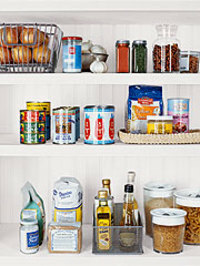 When placing items back in the pantry, place like items together. Heavier items go toward the bottom and lighter items at the top. Place all cleaning products on the bottom shelf or on the floor so that there is no chance of contamination of the food items. If you have small children, you are probably thinking this is absolutely insane for childproofing reasons. It really isn't. In our main floor pantry, we keep snack foods, cereals and cleaning products, while the bulk of our items are in our basement pantry. We simply put a hook-and-eye latch on the door at our eye level. This keeps the children out of the pantry and away from the cleaning supplies. Using your vacuum, clean the bristles of your broom and the strings of your dust mop. Hang the mops/brooms back on their hooks (don't stand them up in a corner--this ruins the bristles) and place any bucket or cleaning caddies on the floor beneath them. This is also where I hang our plastic grocery bag catch-all and my cleaning smocks/aprons. TIP: to cut down on the massive collection of plastic grocery bags, ask for paper bags the next time you go to the market. You can always plant another tree, but we can't always create another landfill, that's my motto. I've found that paper bags are easier to manage when putting them in the car. They fit side by side very neatly. I usually bring my own canvas and oilcloth totes to use. When I'm low on paper bags for holding my recycling items and newpapers on trash day, I will ask for paper at the market. When I am low on plastic bags that I use for changing the litter box, lining the utility room wastebaskets, or containing dirty diapers while away from home, then I ask for plastic bags at the market. But for me to get any type of disposable bag from the market, it has to serve a dual purpose later. Step back and admire your clean and organized pantry! To maintain this work of art, all you have to do is remember to rotate out your items that you keep in there, wipe up any spills or crumbs immediately, and vacuum the floor every week or so to keep any dust bunnies at bay. Occasionally wipe a mop over the floor to maintain, but with proper attention to the pantry on a minimal daily level, the floor should stay clean for longer periods. For more information on a sparkly pantry, you can go to the following places for some great tips, ideas and instructions: Real Simple Magazine, Home Comforts : The Art and Science of Keeping House, Keeping House: Hints and Tips for a Beautifully Clean Home , and of course, Alison has the most wonderful site on all things housekeeping vintage-style!